Overall Thoughts: Now this is a good exert ability. 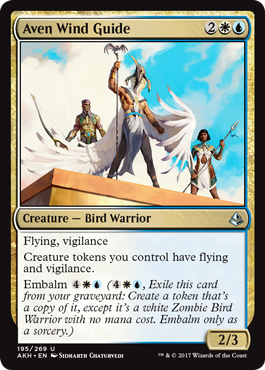 Having two of these in play gives you virtual vigilance for all of your creatures. 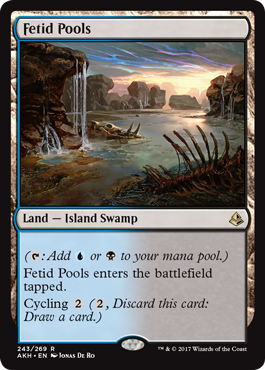 Even if that doesn’t happen, being able to exert this to untap other creatures that may have exerted every other turn sounds pretty sweet to me. Overall Thoughts: So, for 4 mana I get an enchantment that gives me 3 specific mana everyother turn (barring any shenanigans). In a deck built to abuse it, that seems pretty good. Overall Thoughts: Here’s a nice payoff for all of those -1/-1 counters your creatures have been accumulating. Hopefully you’ve cast this before turn 5 due to your mana accellerators so your opponent won’t have good enough defenses built up to block and kill this easily so you can utilize it turn after turn. Overall Thoughts: This is a card that really needs to have a specific deck built for it. You are able to cast this as early as turn 3 (usually), and it might only be a blocker for a few turns if your deck isn’t specifically tuned to play lots of instants and sorceries. This can grow quite large though given time, and since it has flying, it could end the game quickly out of nowhere. 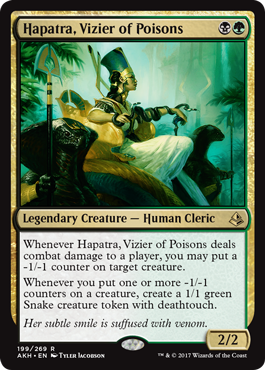 Overall Thoughts: Since Hapatra doesn’t have any sort of evasion, it’s going to be difficult for her to do combat damage to your opponent. 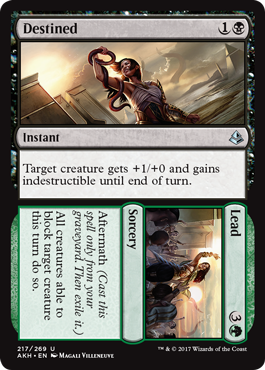 However, there are lots of other ways to create -1/-1 counters in this set, so you should be able to have a loyal army of 1/1 snakes with deathtouch before you know it. 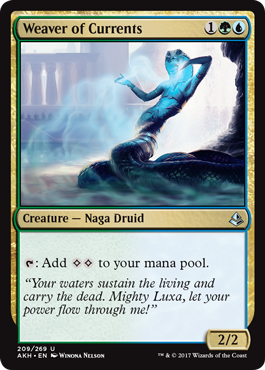 I’m excited to see if anyone will build a deck with both Winding Constrictor and Hapatra in it for extra snake goodness. Overall Thoughts: Without some kind of a boost, you’re likely to only get the +1/+0 bonus once, but sometimes that’s all you need. In a fast, aggressive deck attacking with this can be a real game changer. Overall Thoughts: A 3/3 with trample for 3 is great. Giving trample to your whole team is also great. Reminds me of chocolate and peanut butter, two great tastes that taste great together. Overall Thoughts: Slowly weakening your opponent’s team while denying them the ability to block (at least for the turn) can be very strong as the game goes on. Sign me up! 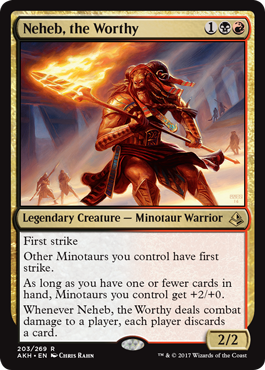 Overall Thoughts: Neheb is a nice minotaur lord. 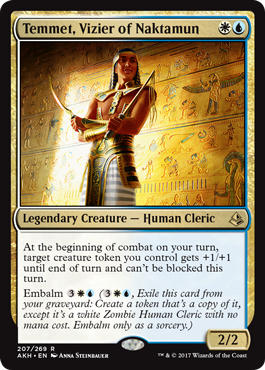 He definitely wants to be in a deck that wants to have no cards in hand each turn, so he gets along nicely with Hazoret. Overall Thoughts: While she doesn’t have an ultimate ability that lasts longer than the turn, she has lots of potential. 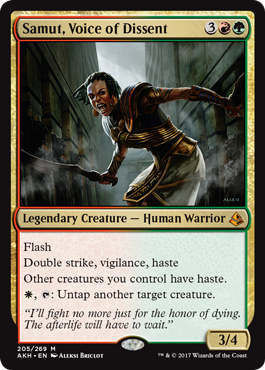 First off, she can enter the battlefield with as few as 1 or as many loyalty counters that you have the mana for. That makes her extremely flexible. Her +2 ability helps when you do her 0 ability on future turns, as it not only increases her loyalty (thus increasing the converted mana cost of the cards that she can play), and it also sets up the card you will be playing from the library. Synergistic, indeed. Her -6 ultimate is a way to end the game quickly if you need help with that. 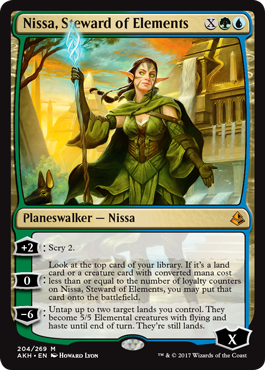 This is a very well-rounded planeswalker. Overall Thoughts: This card has a sort of prowess-like effect, however it’s not as good as prowess is. With that being said, this ability can still wreak havoc on your opponents combat math. And since this has flying, you might be able to swing in for the last few points of damage needed unopposed. 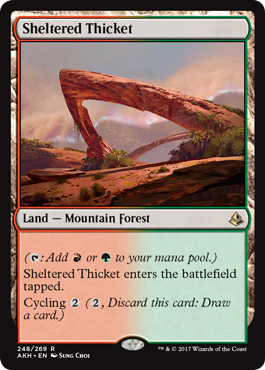 Overall Thoughts: The drawback to this card is the need for creature tokens. 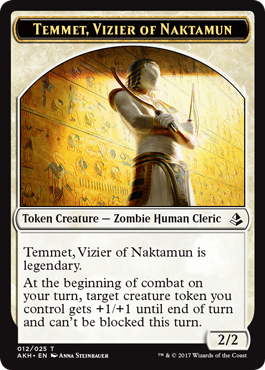 The good news is that Temmet has embalm, so in a way he’s a better creature once he’s been embalmed as then he can always target himself if there’s not a better target. 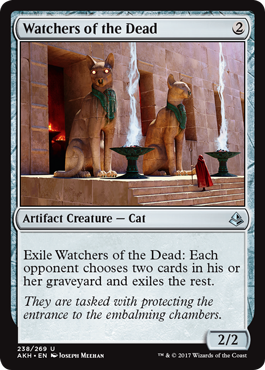 Overall Thoughts: This card will be a great addition to any zombie tribal deck or any deck centered around embalm creatures. Who knows, maybe there’ll be a deck that’s a hybrid of both types? Overall Thoughts: This is a great card to help ramp your mana up if you happen to need colorless mana. 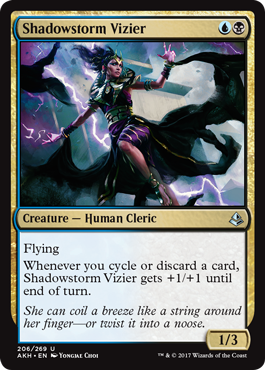 I could see this having this in a Crush of Tentacles deck, or alongside Nissa, Steward of Elements to help get her starting loyalty up. 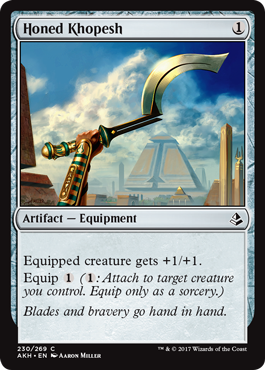 This could also even help in a Temur deck using X-costing spells. 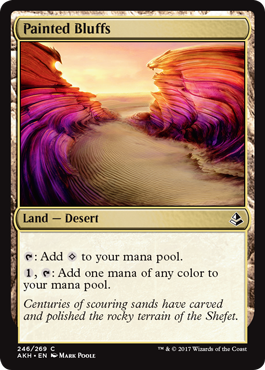 Or use it with Cascading Cataracts and turn your colorless mana into whatever color of mana you need each turn. It does only have a 2 toughness though, so it’s a little fragile. Overall Thoughts: Here’s a bit of more syngery between two halves of a split card. 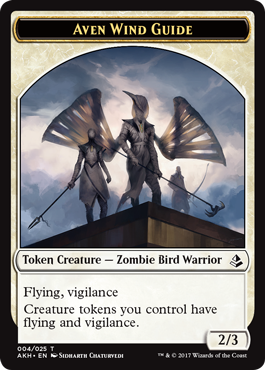 Use one of the tokens you create with Start to be sacrificed for Finish to destroy your opponent’s best creature. Very synergistic. Overall Thoughts: While the two halves of this card don’t have the synergy I’d like, each half has an ability that has usefulness. 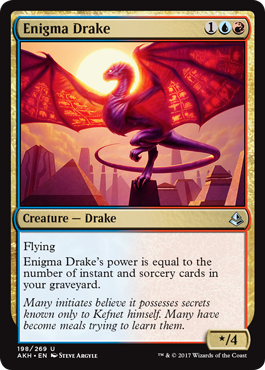 The main downside to this card is that Red/Blue decks usually do something based on the number of instants and sorceries in your graveyard, and this only counts as 1 card. Overall Thoughts: And we’re back to the synergy in split cards. 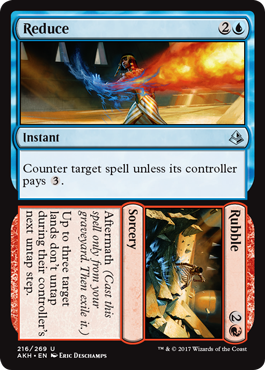 For 6 mana, you can make your creature indestructible and lure each of your opponents creatures to block it, which frees up the battlefield for your other creatures to attack unopposed. That could be ‘game over’. Overall Thoughts: And the synergy continues. When I first saw this card, all I could think about was Electrostatic Pummeler. Either side works wonders with the Pummeler. Or play them both along with something to provide trample to it, and it’s likely that your opponent is dead. But it works pretty well with other creatures too. 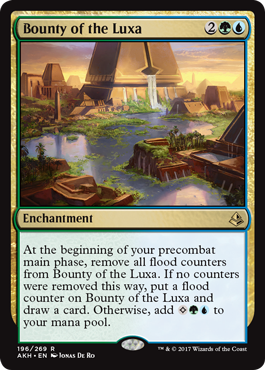 Overall Thoughts: Well, the good news is that the effect for each half of this card is a pretty iconic thing that the color can do. 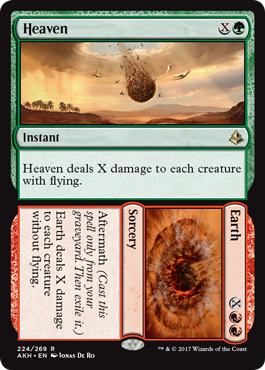 The bad news is that each effect is a bit on the expensive side to do it, so this card probably won’t see much play. Overall Thoughts: Another synergistic split card, this one can give you a boost plus lifelink or the ability to fight an opponents creature. Used together in the same turn, this is pretty good. If used separately though, the Fight side of the card is overcosted, which is understandable for it being able to be played from the graveyard (it’s effectively like having another card in your hand at that point). 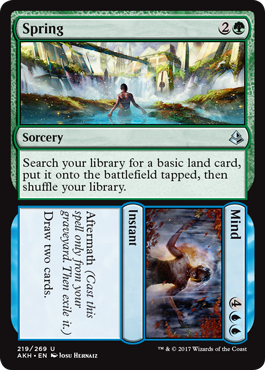 Overall Thoughts: This is a great example of a split card that has great synergy and can easily have both sides of it cast in the same turn. 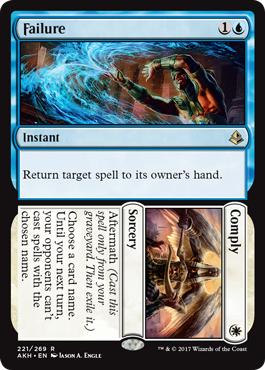 I like this best though as a late turn counter, using the Failure side to return an expensive creature or other spell back to your opponents hand when they don’t have enough mana to recast it, and then casting the Comply on your turn to make sure they can’t play it on their following turn. 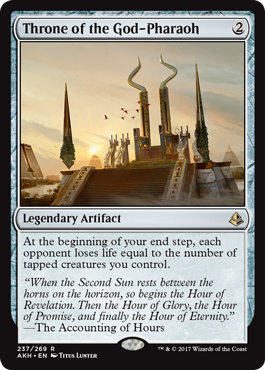 Overall Thoughts: Simply due to the mana costs, I think many decks might play this card simply for the Rags side, as giving each creature -2/-2 until the end of the turn can act as a sweeper card. 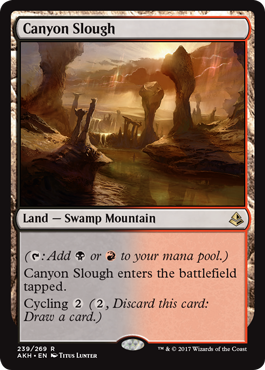 It is a little overcosted, however the prevalence of -1/-1 counters in this set should help this card get rid of the larger creatures in play. 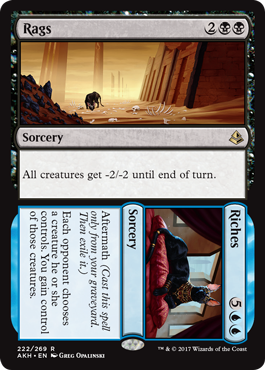 The Riches side of this card is very subjective as to when to play it, since the choice of creatures you gain control of is made by your opponent. The nice thing is that it is a sorcery, not an aura, so once you gain control of the creature, it’s very difficult for your opponent to get it back. Overall Thoughts: Cut, Electrify would like to have a word with you. So I guess it costs 2 more mana to make a 4 damage to target creature spell become an instant. Good to know. While Electrify got a lower rating due to its high mana cost, Cut gets a higher rating. There are many creatures with 4 toughness and the majority of them don’t have haste, so it’s okay to wait until your turn to kill them (although there are some cards like Glorybringer that you might want to board in the Electrify for). 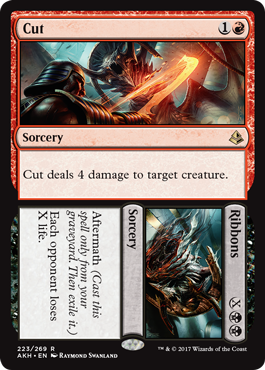 Ribbons is a teriffic mana sink to deal straight damage to your opponent’s dome, and a great way to end the game out of nowhere. Overall Thoughts: It’s hard to imagine a deck that will want to play both halves of this card, but I suppose it’s possible. More likely though, green decks will try to keep this in hand and red decks will try to discard this as soon as possible so it can be played when it is needed. Both halves are very good ways to clear out an opponents creatures and since they are flexible in their mana costs can be played whenever you feel it is advantageous to do so. 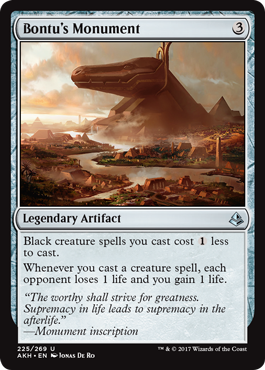 Overall Thoughts: Getting a cost reduction to black creature spells is nice, but I have a feeling this could see play in decks that aren’t running a single black creature thanks to the draining ability whenever you cast a creature spell. Overall Thoughts: This card is very weak before it has 3 brick counters on it. Stopping one creature from attacking guarantees that your opponent has a blocker for your attack. 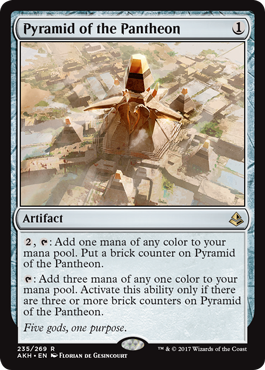 Once you get the three brick counters on it, this card is good, but in all but the most durdley of decks this card is going to be too slow to see much play. Overall Thoughts: Here’s a good card for embalm decks. That’s the only place I see this having a home, and not every embalm deck will want it. Overall Thoughts: So, since we don’t know what God-Pharaoh’s Gift is yet, we’ll have to evaluate this based on the first ability only. Luckily, it’s pretty good. Gaining a point of life may seem trivial, but it could add up. Also, being able to loot for each nontoken creature dying is really good. I don’t think it’s good enough to see much play, but that might change once Hour of Davastation is upon us. 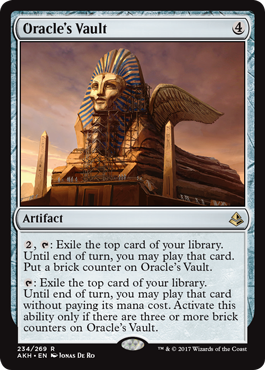 Overall Thoughts: The rummaging ability is a little strange to see on Hazoret’s Monument. 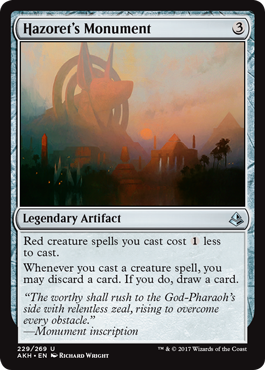 Since Hazoret wants you to have no hand (or one card at most), discarding the only card in your hand to draw another seems counterproductive at least a portion of the time. I can see this seeing more play in non-red decks, though, as a way to get better card selection. The reduction in cost for red creature spells is just a bonus on this card. Overall Thoughts: 1 mana, +1/+1 bonus, 1 equip cost, and 1 rating. Seems about right. 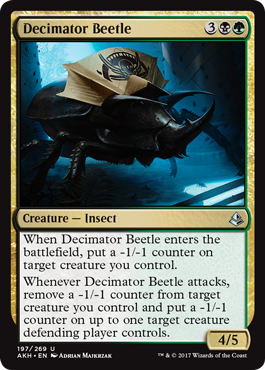 While this does counter the effect of having a -1/-1 counter on the equipped creature, this is about the most bland piece of equipment you can have. 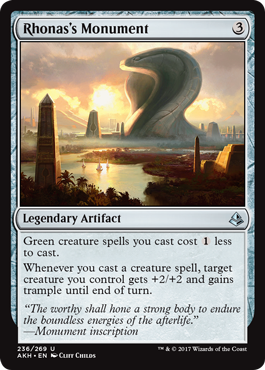 Overall Thoughts: So far for all of the monuments, the mana reduction has just been a nice bonus, while the ability is the best part of the card and usually seems suited for decks of other colors than the color of the associated god. This monument is no exception. I can see this potentially being played in a white weenie deck or a red deck in order to clear out blockers. 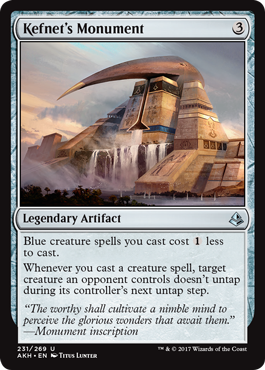 I don’t see blue decks being particularly aggressive, though. Overall Thoughts: While gaining 2 life each turn can be beneficial, it simply takes too long to accomplish with this card. There’s a small chance that a deck will come along that uses improvise that will want cards that use brick counters, but probably not. 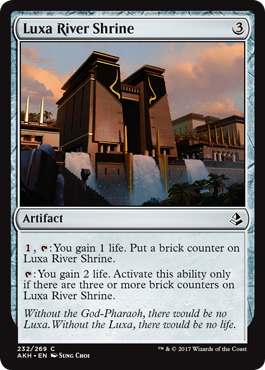 Overall Thoughts: Finally, a monument that seems well suited to the god that it’s for. Getting an extra creature every time you cast a creature spell is great. And for white decks, the mana reduction will be put to great use casting lots of white weenies. This is a great card. Overall Thoughts: Finally we have a card that gains brick counters that seems like the effort needed is worth the reward. Not every deck will want this, but the ones that can scry a big creature or a very powerful spell to the top of their deck can certainly make good use of this. 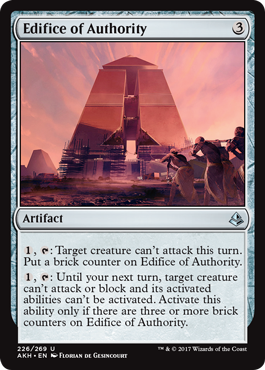 Overall Thoughts: Here’s another brick counter artifact that could prove its worth in Standard. I don’t think this is a card you want to play on turn 1 and activate turn after turn, because you could quickly fall far behind on the battlefield if you do, but it’s a nice card to have for those times when you have extra mana and no cards to spend it on. It’s still slow to activate it, but getting 3 extra mana each turn in the late game could be worth it with the right outlet for it. 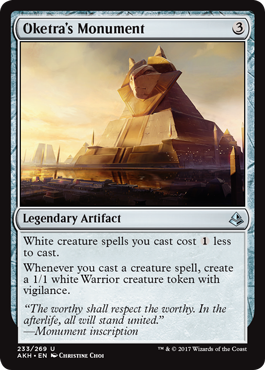 Overall Thoughts: This could be the most difficult of the monuments to take advantage of since it requires a creature to be in play for you to use its ability. If you do have such a creature, the ability is powerful, and since it can be triggered multiple time each turn, it could be game ending. But it’s the most iffy of the abilities, so it gets a lower score. Overall Thoughts: This seems like a win more card to me. If you have a lot of tapped creatures ate the end of your turn, chances are that you’re already attacking for some damage and your creatures aren’t getting blocked and killed. This could be another good card for a Cryptolith Rite deck, though. Overall Thoughts: Since your opponent can choose cards with multiple types (like Walking Ballista), this card is good graveyard removal, but it’s far from great. I do think this might see some play in a cat tribal deck, though. Overall Thoughts: (Please note: My rating and thoughts for each of the ‘bicycle’ lands is the same.) I think all of the bicycle lands will see some amount of play, but the fact that they always enter the battlefield tapped is a real drawback. 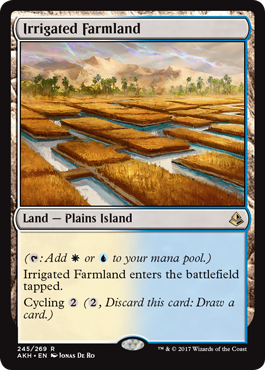 They do help with the dual land cycle from Shadows Over Innistrad (the ‘reveal’ lands), however, as you can show a bicycle land from your hand to allow the ‘reveal’ land to come into play untapped. 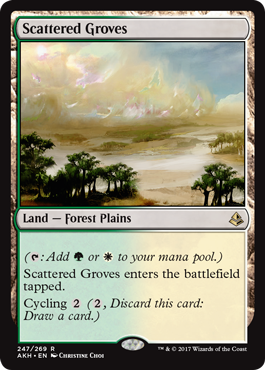 This is a good cycle of lands, but currently in Standard there are slightly better options. 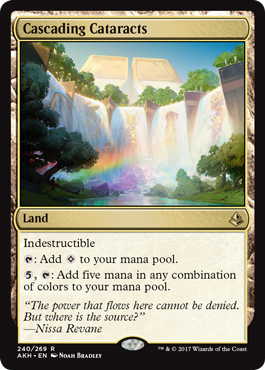 Overall Thoughts: Having the right color combination of mana to cast any spell costing 5 mana or less once you have 6 mana is nice, but unless you’re really working at breaking this effect, you’re likely better off looking for other sources of mana ramp to play. Also, this card isn’t very good for control decks if you can’t use all 5 of the mana right away, as the opponent can go to the next phase and your leftover mana will drain away. Overall Thoughts: Hey, look! A desert card! 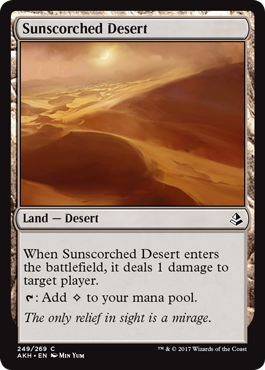 This happens to be the first land with a desert subtype we’ve seen in the set so far and it’s not very good. The Eldrazi are still in Standard, so there’s a remote chance this will see a little play, but I’m highly doubtful. 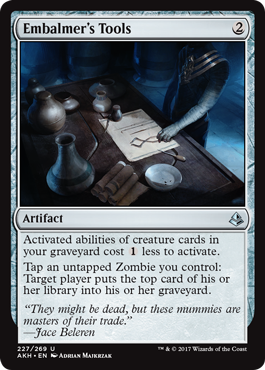 I can’t think of a single deck that wants colorless mana and may also want to create 1 zombie at sorcery speed. 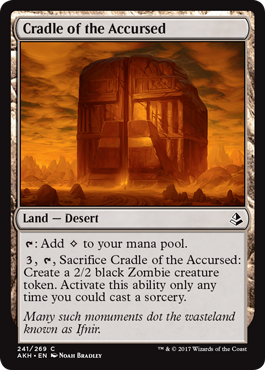 Also, this only creates 1 zombie at the cost of 3 mana and this land being sacrificed. That’s a horrible rate of return. This card is just bad. Overall Thoughts: This is a good utility card that sees a little play in most Standard environments. Overall Thoughts: Oh, look. Another desert card. This one isn’t much better than the first. 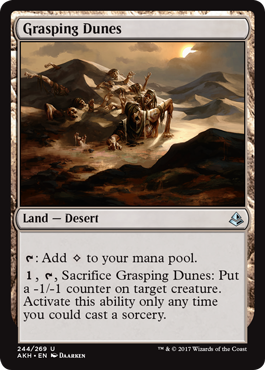 At the cost of 1 mana and the permanent loss of this land, you can put a -1/-1 counter on any creature in play. I don’t think even the most dedicated of decks that are utilizing the -1/-1 counter theme will want this card. Overall Thoughts: And we have our mana filtering card for the set. these are usually put into a set for limited mana fixing, so it’s not surprise they aren’t played in Standard. There’s simply better options than this card. 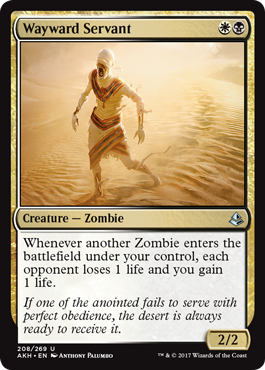 Overall Thoughts: We’ve finally made it to the last card and it’s another desert card. This one also only produces colorless mana and deals 1 point of damage to your opponent when it enters play. Since there’s a decent amount of effects that flicker and bounce things, there’a chance that this could see a little play in those decks. In general though, this card isn’t very good in most decks. 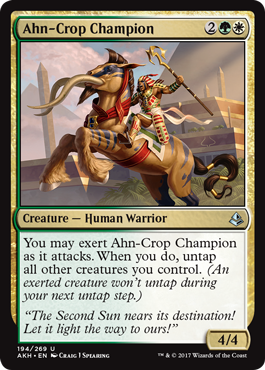 And that completes my review of Amonkhet for Standard. How did I do? Was I way off on anything, or did I nail everything on the head? Let me know what you think by leaving a comment below. I’m always interested in hearing what other people think about new cards. 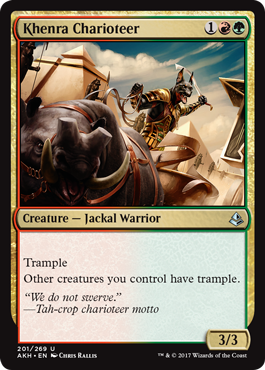 Thank you all for joining me on this journey to Amonkhet. 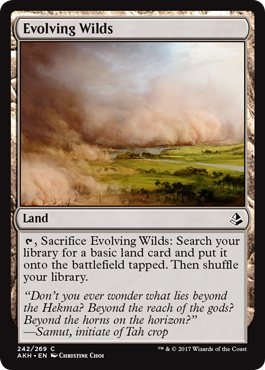 We’ll do it again when Hour of Devastation gets previewed in a few months. In the meantime, be sure to join me here every Friday for another installment of Raise Your Standards where we’ll take a look at the landscape of Standard and go over innovative decks. Thanks for reading!